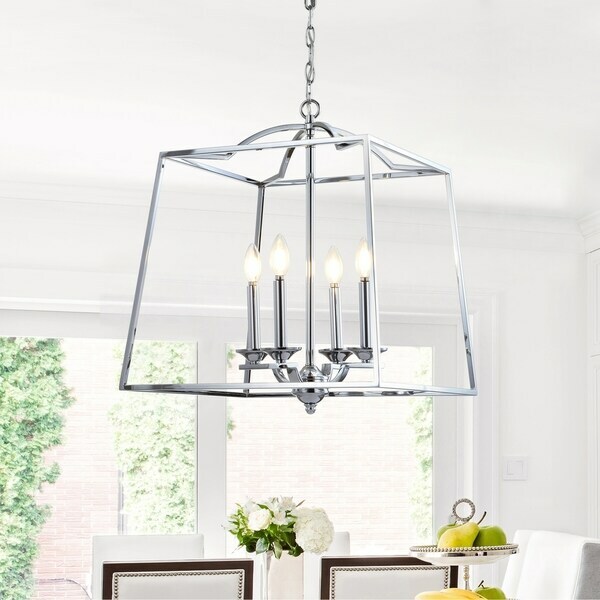 Elegant in its simplicity, this chrome lantern pendant is fabulous in a modern foyer or hung as a pair over a kitchen island. Boasting four bulbs, you can select to use incandescent (40W), CFL (13W), or LED (9W) bulbs for the warmth of glow and energy efficiency you desire. We love how the classic shape was update by removing the glass siding, allowing the fixture to put less weight strain on your ceiling and emitting maximum glow without the glare. Dimensions 19.0 In. X 19.0 In. X 98.5 In. Absolutely LOVE! Looks even better than I expected and great high end look for a very low price. The scale is also larger than I would have thought for the price which is great because I love oversized lighting.